This past weekend was my ultimate yogi and surfer dream! It was full of different workouts, street fairs, surfboards and a lot of ocean time. Recently, as you might know, I have been running again since the weather is tolerable, and one of the best workouts for surfers is to run against the wind. As I was running down the beach just partway through my 3 mile run, I spotted a surfer practicing yoga in her wetsuit. Now, stretching is a common occurrence for surfers, but this yogini/surfer was practicing a full sun salutation in a dry wetsuit. This is no easy thing since the dry wetsuit doesn’t really bend with your body until it’s wet. After seeing this yoga practice in a full on wetsuit, I know have set the goal to complete a full sun salutation while “suited up”. I will keep you posted on how that goes. 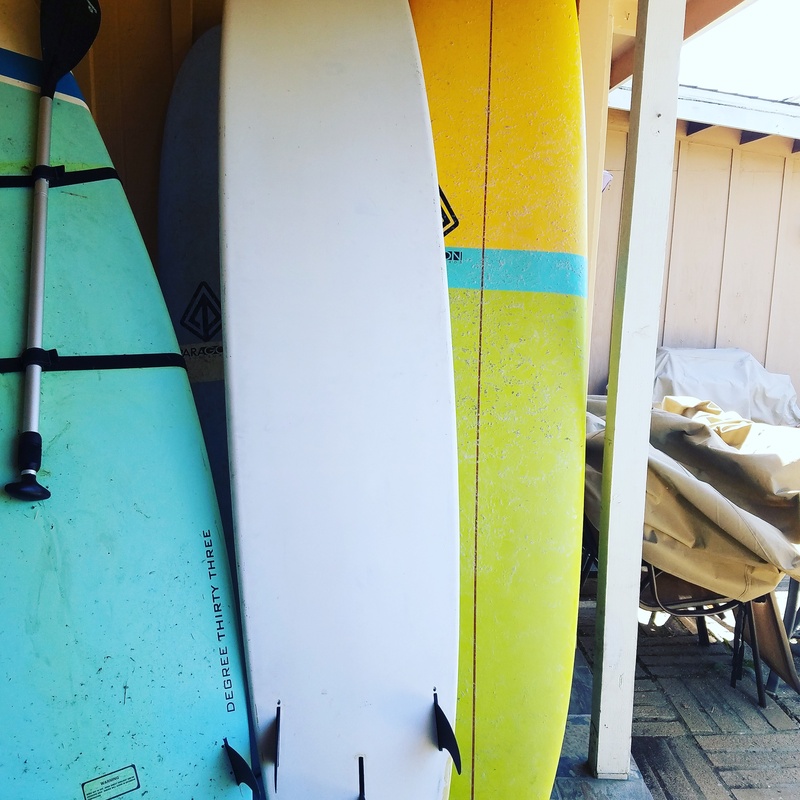 My husband and I also went down to the local Ocean Fair and Surfboard Swap. 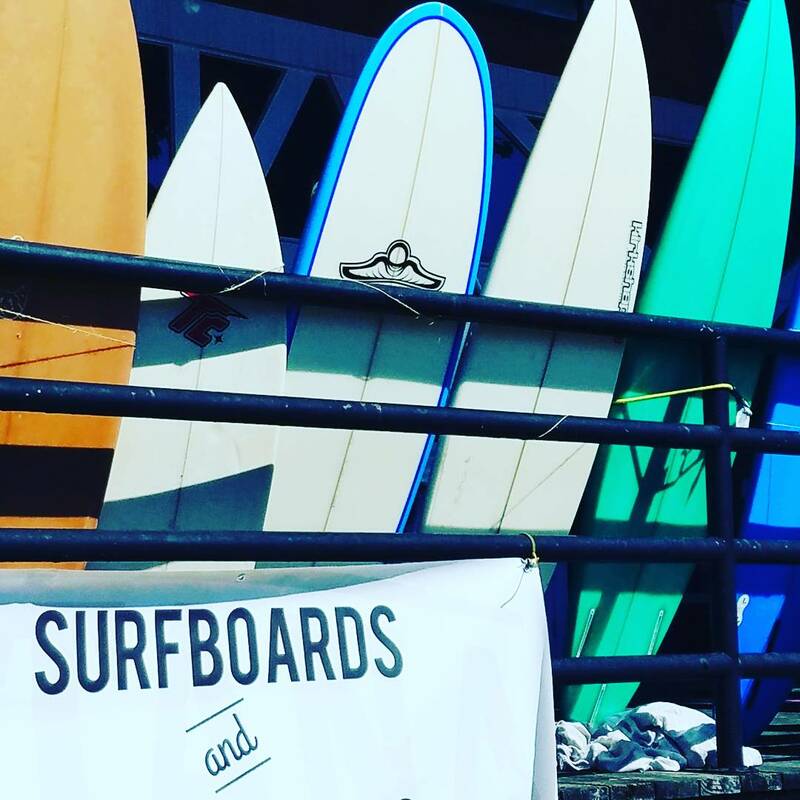 I always have loved street fairs, and this one was combining two of my favorite things: surfer clothing and surfboards. The quality of the surfboards in the surfboard swap were incredible. Everything from Pearson Arrow to Ward Coffey. Surprisingly, while I was looking at surfboard t-shirts (never can have enough t-shirts), my husband ran over to me. He practically dragged me to this used surfboard to look at. It was a longboard, 9’6″, with no shaper information. It didn’t have a ding in it, and since there was little information, the price was good. Recently, we have had friends and family interested in surfing, but we never have a surfboard to provide them. So, of course, we bought the board. You can see it in the pic below. It’s the white longboard. Also, if you are interested in very awesome throw back pics of surfers, check out Stay Weird Surf Company on Instagram.